Mojo Motorcycles now official importer for Daelim Scooters and Motorcycles in Australia. Australia has a new Daelim Importer/Distributor. Mojo Motorcycles is currently the importer for TGB, Sachs and CF Moto product and has now added Daelim, the quality Korean brand. Look out for scooters like the B-Bone(Pictured Below) that will finally, yes finally make their way to Australian shores. Leading motorcycle & scooter distributor, Mojo Motorcycles today announced a new distributorship relationship with Korean manufacturer, Daelim Motor Corporation. Under the terms of the new relationship Mojo Motorcycles will be responsible for the distribution, sales and marketing of Daelim’s exciting range of motorcycles and scooters within Australia. As Korea’s largest manufacturer of motorcycles and scooters, Daelim holds an enviable reputation for quality, offering a number of models which have been refined over the organisations thirty year history. 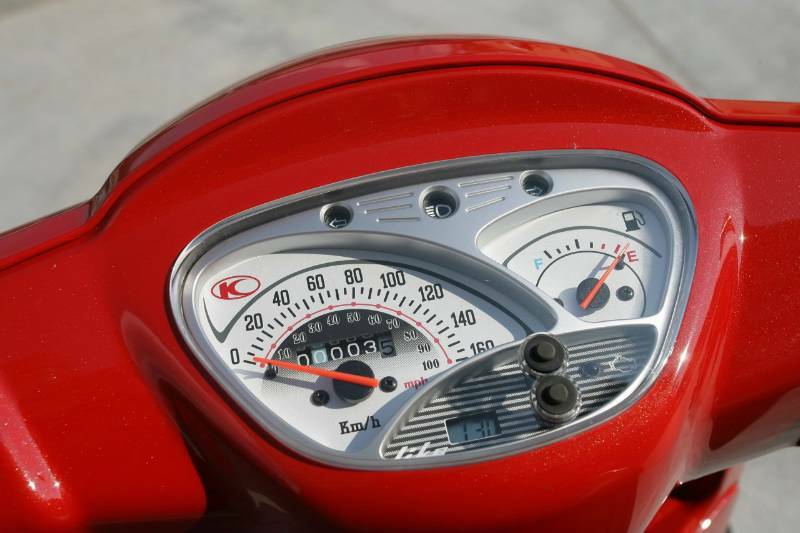 The company will offer Australian consumers a revised line-up of motorcycles and scooters targeted toward the local market. The new product line-up will be spearheaded by the VJF250, an aggressively styled sports bike with a liquid cooled 250cc EFI engine. The VJF250 is set to shake up the competitive learner approved market, offering a low seat height, front and rear disc brakes, exceptional build quality and an extremely competitive price point. Mojo Motorcycle General Manager Michael Poynton was excited about not only the VJF250, but the entire revised product line up. “Our revised product line-up, including the VJF250, will fit exceptionally well within the current market place and offer consumers a real choice” commented Poynton. “We are extremely impressed with the build quality of these products and once our new pricing structure is revealed I’m sure our customers will be too” he concluded. All products offered in Australia will be supported by a two year, unlimited kilometre warranty. A complete product line-up and competitive pricing structure is expected to be confirmed by the end of next month. Another chapter of a long running, collaborative relationship is written as adidas Originals once again teams up with Italian scooter brand Vespa. The partnership makes sense. 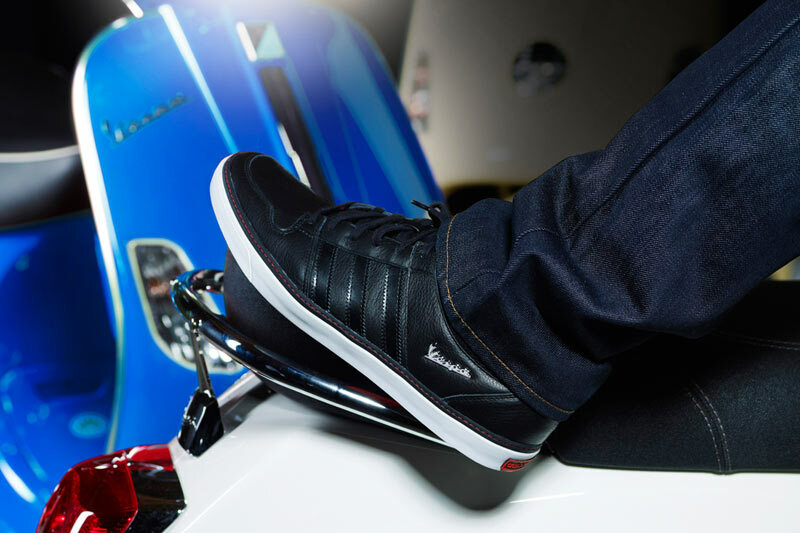 Vespa, like adidas Originals, is the perfect expression of a uniquely distinctive lifestyle. With enduring success - owing much to their symbolic and iconographic identities - a combination of cultural sensitivity and constant innovation has seen both brands continue to surprise and delight fans all over the globe. In perfect illustration of such a claim, this newest range harmoniously straddles decades; marrying contemporary technology and trends with the colours, design language and cultural inspirations of pop art and the mods from the brands’ 60s, 70s and 80s periods. Available exclusively at Foot Locker in Australia and New Zealand, this much anticipated range of sneakers is lead by the ‘adidas Vespa Low’ which, as the name suggests, features low profile vulcanised styling, premium materials, and no-expense-spared metal badging and lace tips. To commemorate the occasion, Foot Locker and adidas Originals are giving away a shiny new Vespa LX50 Scooter, valued at $4,999. 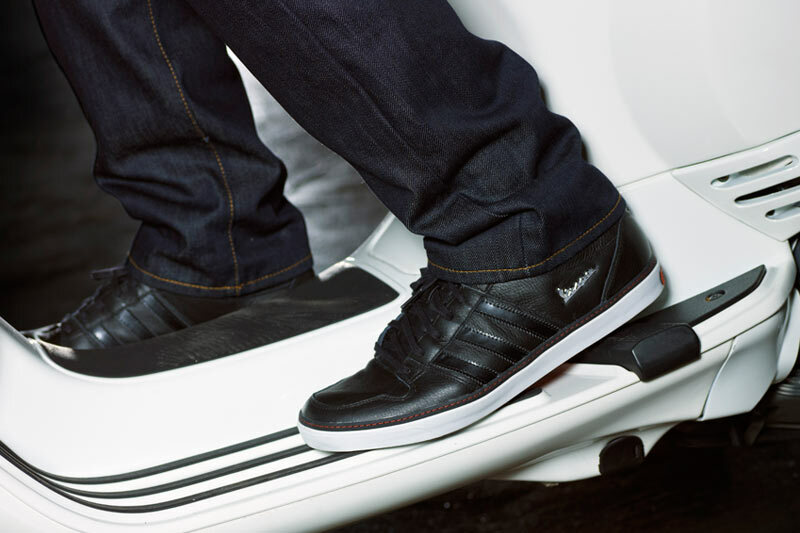 One lucky customer who makes a purchase of any adidas Originals Vespa sneakers will win. To enter, people with the new kicks simply need to start the ignition of their imagination and say what their most Original Vespa license plate would be. Fate will take it from there and award the best answer. The promotion starts Sept 15th and ends Oct 10th, across Australia and New Zealand Foot Locker outlets. Sydney dealer uses tweets to get the message across to the flock. We've been tweeting for a while now here at Scootersales.com.au. You can simply find us at the address Scootersales. But for Sydney dealer Scooteria Tweeting has now become a way of communicating every day special deals to his merry flock of followers. Found at the address "ScooteriaAussie" be apart of big Wenz's daily tweets. Just by following you can pick up exclusive deals. A special of the day on accessories or maybe a "that day" exclusive deal on the cost of getting your scooter serviced. Whatever the case its all instant gratification when you follow big Wenz and his tweets. So on Twitter ? Or heard about Twitter? Maybe its time you get into the sensation that is Twitter. You never know you may just score yourself a daily deal. New name calls for a new promotion. CF Moto V5 now available with a free set of panniers. To celebrate the re-branding of the ever popular V5, CF Moto are running a fantastic promotion by offering a FREE set of panniers to the value of $399 for every new CF Moto V5 purchased between now and December 31st 2010. The good news is that the RRP remains the same so now the CF Moto V5 is even better value for money than ever. Colours available include Black and also a vibrant Red/Silver. Also don’t forget a windscreen is available as an option. Being an everyday rider means you have to meet whatever the weather and road conditions throw at you and Piaggio's new Mp3 300 can take pretty much everything in its stride. While many typical two wheelers can give you the impression they'd prefer to bit tucked away in the garage when things get downright ugly, the MP3 is in its element. The unique dual front wheels provide unrivalled grip and stability on a multitude of surfaces including wet roads, slick manhole covers and white lines and the equally frightening tram tracks. 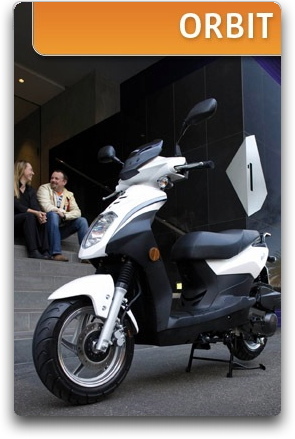 Since release, the "Scooter of the Year" winning MP3 has broken new ground in the Maxi scooter category creating a loyal rider base who recognise and embrace the superior road holding, braking and technical advantages only this innovative design can offer. The new MP3 300 further develops these unrivalled features with the addition of the proven 300 Quasar motor for more grunt and ease of use compared to its predecessor. A new 14 inch rear wheel and all new body styling enhance the design to offer the most refined MP3 to date. It's taking everyday riding to a whole new level. Larger liquid-cooled, 4-valve, EFI, 278cc engine for more power and improved low end torque for better fuel economy. 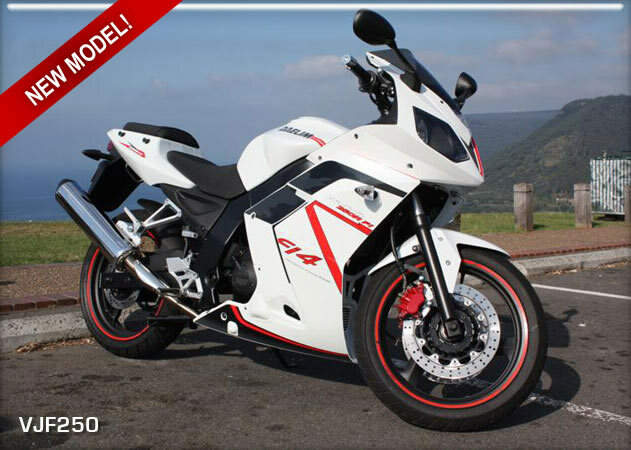 Leading technology ride by wire throttle control technology optimises air fuel mixture for smoother power and enhanced riding comfort. New screen and body styling include redesigned ergonomic seat and passenger backrest. MLP is at $9,990 plus on road costs: Colours include Silver, Black, Red and Blue. The Piaggio company, nestled in the Tuscan countryside between Florence and Pisa, first invented scooters in 1946 when it produced the first ever Vespa. 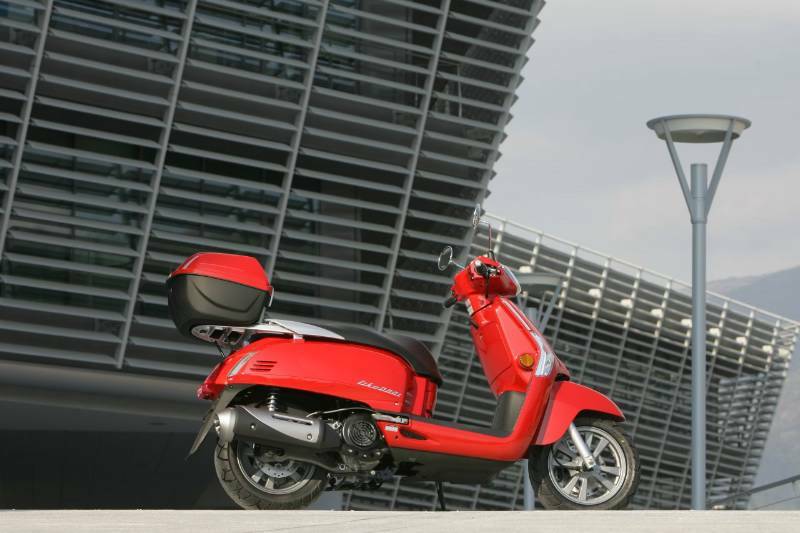 Today, Piaggio continues to produce scooters under three brands: the classic Vespa, the sporty Gilera and the contemporary Piaggio. 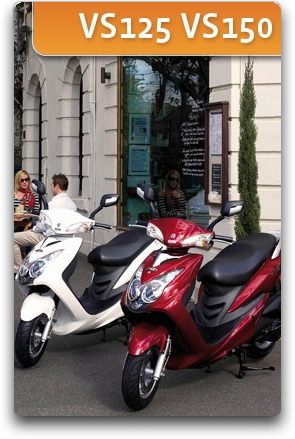 In Australia, the Piaggio brand offers an extensive range of quality Italian scooters from 50cc to 500cc. 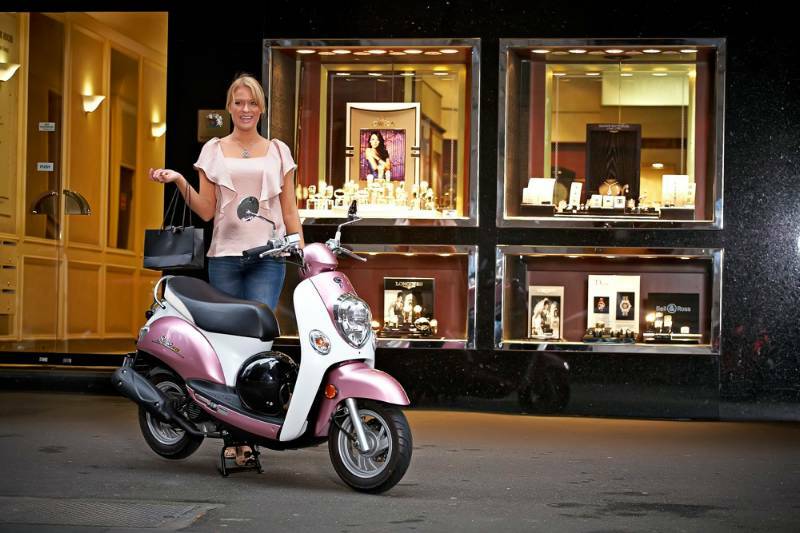 Piaggio is the choice for discerning commuters who insist on a modern design with the quality that can only come from 60 years experience as a specialised scooter company. Its taking a bit longer then we would have liked, but we get first ride. We saw it first at Eicma 2009. The larger capacity Like was going to be here mid 2010, latest update is the "end of year" . But lets just say the wait will be worth it. When visiting my pals at Kymco last week I came across this eagerly awaited model and couldn't help myself. Keys Please? Before anybody could say no, I was starting her up and accelerating down the road. First thing you do notice is the ease of starting, fuel injection always helps in this regard and with the Like 200i, its no different. Next is the extra urge you get when you twist the throttle. Nice and smooth, a steady surge that will ensure the Like 200i is sufficient at getting around not only local roads, but also those motorways where maybe a 125 might not have the power required. By seat of the pants feel, top speed will be well over the legal limits and getting there is no lengthy process. Everything else is pretty much as we know it, as seen on the 50 and 125. Classic lines, twin disc brakes, good storage via a standard top box, accompanied by a flat floor and ample underseat storage. So all up a pretty well decked out scooter. Price has been set at $3990 + ORC. 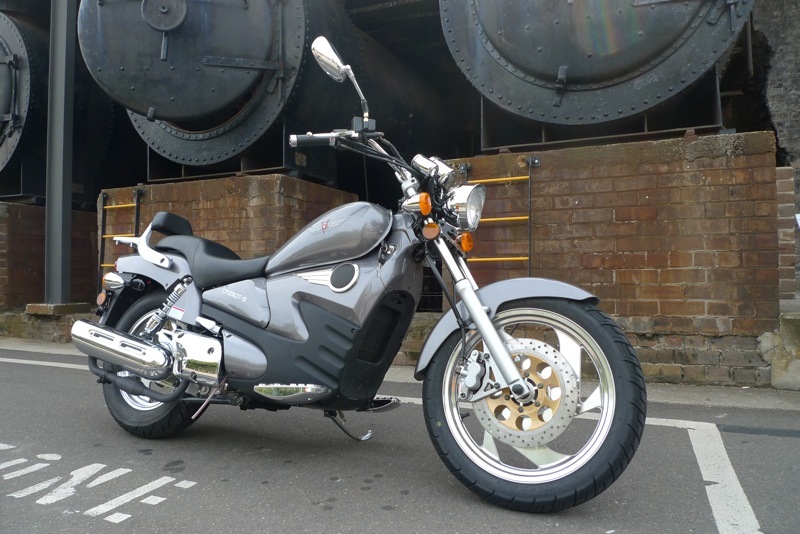 The engine is that borrowed from the People S 200, the 163 cc powerplant that pumps out a very usable 8.5 Kw @ 7250 rpm. More impressive though is the torque figures, 11.97 Nm at a low 5500 rpm. So reliable, smooth with plenty of power down low. Handling wise it still feels like the 125, extra weight from the engine has not burdened this machine. In fact it only weighs in at 4kg's more then the 125, all of 120 kg's all up. All up its a winner. 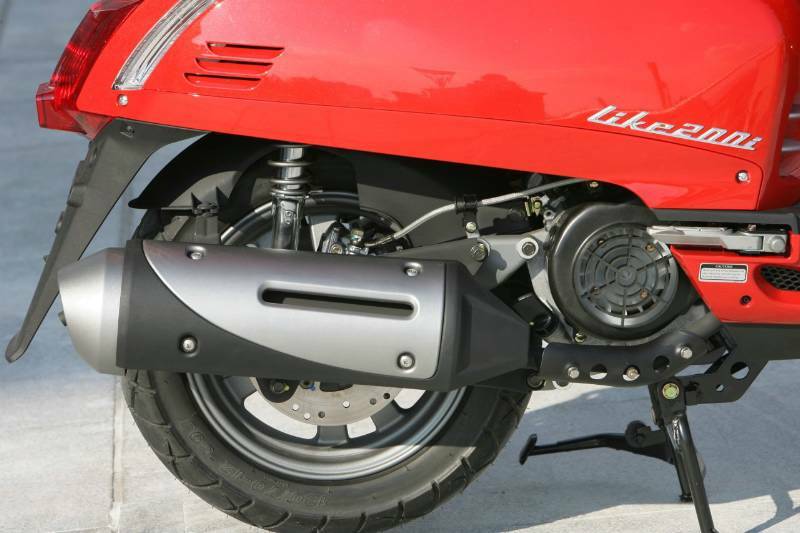 Good looks matching, ample performance, the Like 200i is the best of both worlds. For our review of the Like 125 take a look here, till then you'll just have to wait to get your hands on the "nearly here" Like 200i. Bake some cakes, win a Kymco Sento 50 and Agility RS 125. Both valued at over 7 and a half grand on the road. The correct answer is cupcakes!! Only three more weeks to go until the RSPCA announce the winners of the RSPCA Kymco Cupcake competition. 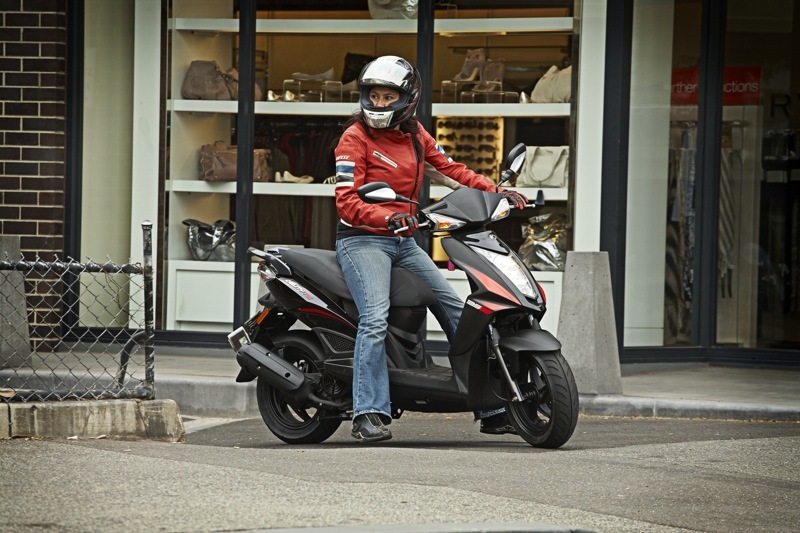 Entrants of this competition have the chance to win two fabulous Kymco Scooters, the Sento 50 valued at $3,390 ride away and the brand new Agility RS 125 valued at $3,190 ride away. 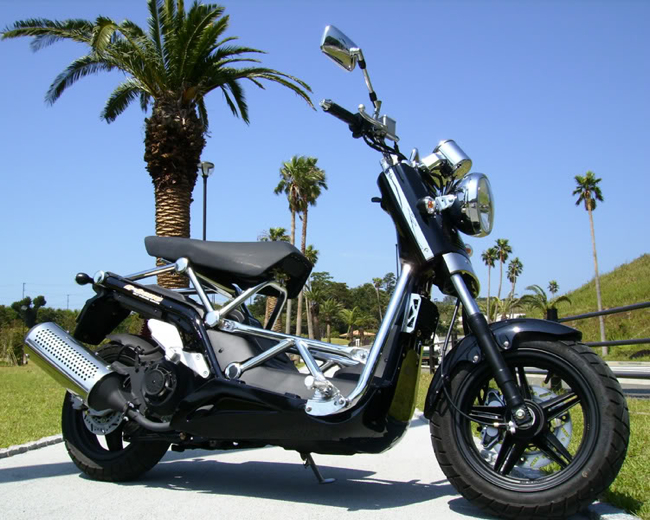 The Sento is a classically designed scooter with a single cylinder 4T 50cc engine with high fuel efficiency. 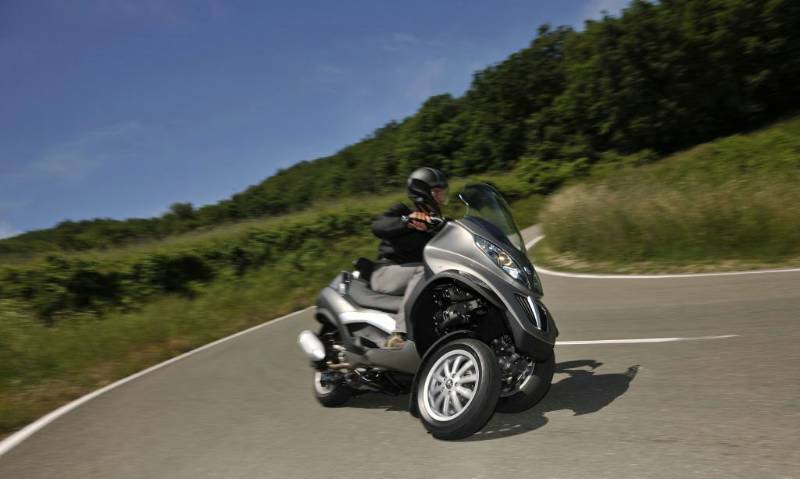 The Agility RS is a stylish, economical scooter built with a 125cc 4-stroke engine to ensure high sports performance and handling for its users, with the air-cooled engine providing enough power and riding stability for any rider. These attractive scooters with high-class features are sure to attract many fans, so get involved for the chance to win! 2. Set up a fundraising page. 3. Send the fundraising page to friends, colleagues and family. 4. Collect over $100 in donations. For every $100 donation raised and entered on to the RSPCA website you will receive one entry into the draw. The more money you raise the more entries you get! There is still plenty of time to get your apron on and start cooking for the RSPCA. And as a bonus you will go in the running to win 2 super dooper Kymco scooters!!! The Kymco RSPCA scooter competition will be drawn 12pm EST on September 27th 2010. Get baking for your chance to win! Kymco is a proud supporter of the RSPCA and is of course of the finest pedigree. TGB Extended Warranty Promotion – 5 years Unlimited Km Warranty on Tapo and Bullet 150 models. New owners of TGB Tapo 50cc and Bullet 150cc scooters will now be eligible for an extended five year unlimited kilometer warranty following the launch of a new promotion by TGB this week. Under the new program all TGB Tapo 50cc and Bullet 150cc scooters sold will have their warranty increased from a two year period to an unprecedented five-year unlimited kilometre warranty period. “We believe that when you purchase a new vehicle you have the right to peace of mind” stated TGB brand manager Joshua Carter. “This extended warranty will help you maintain that peace of mind and provide your new Tapo 50cc or Bullet 150cc with full cover for parts and repairs for an industry leading 5 year period” he continued. “The decision to offer this extended warranty really reflects the confidence we have in the build quality and our belief in the TGB product to withstand the Australian conditions” reflected Carter. “While other manufacturers are increasingly turning to Chinese manufacturing in a bid to decrease costs, TGB continue to have 100% of their models manufactured on-site at TGB’s Taiwanese manufacturing facility guaranteeing superior quality” he stated. “Perhaps most excitingly, our extended warranty program is being rolled out with no change to our pricing structure – the Tapo 50cc and Bullet 150cc remain at their same respective competitive prices. This is a real free-kick for our customers” concluded Carter. The Bullet 150cc, with its updated larger displacement engine, redesigned frontend with twin headlight, new dash display and ability for easy highway cruising, remains priced at $3,390 plus on road costs. 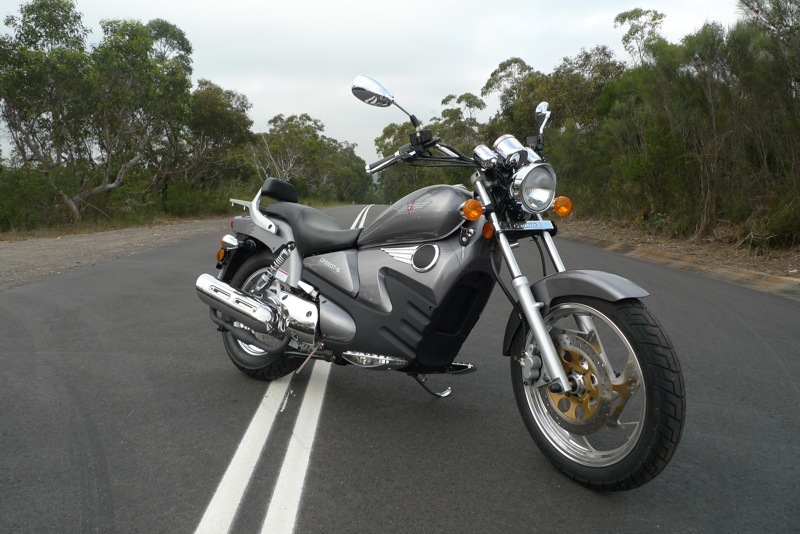 The Tapo 50cc, with its modern euro-styling and LA licence classification, holds it price at $1,990 plus on road costs. Both the Tapo 50cc and Bullet 150cc were introduced as new models at the beginning of this year and have already become two of the most popular selling models in the TGB range. The TGB extended warranty promotion for new vehicle purchases of the TGB Tapo 50cc and Bullet 150cc will run from September 1st 2010 through December 31st 2010. The Snowy Ride has raised more than $2.8 million toward childhood cancer research, and is one of the largest motorcycle fundraising events in the country. 3 September 2010 - The Steven Walter Foundation (SWF) and Honda Australia celebrated their tenth year of partnership last week at an event to kick off the 2010 fundraising drive for childhood cancer research through the annual Snowy Ride. The Snowy Ride has raised more than $2.8 million for the cause, and is one of the largest motorcycle fundraising events in the country with more than 3000 riders from across Australia, New Zealand, US and Europe converging upon the picturesque Alpine roads of NSW. The launch event, held in Sydney and involving a number of high profile guests from the Children's Cancer Institute of Australia (CCIA) as well as the media, was an opportunity to announce Honda's further five year commitment to the Snowy Ride. "Honda Australia has been the major sponsor of the Snowy Ride since day one and we are truly grateful for their further commitment of $100,000 per annum over the next five years. Their support has been key to our success" said Mrs Sue Walter, Director of SWF. Mrs Walter also presented a $100,000 cheque to the CCIA on the night. "Before my son Steven died from childhood cancer at the just 19 years of age, he asked his family and friends to do everything in their power to prevent what happened to him from happening to anyone else," Mrs Walter said. Tragically, three Australian children still die from childhood cancer every week, and those that survive have long term side effects that dramatically affect their quality of life. Professor Michelle Haber, executive director of CCIA said "We never thought that the SWF's Snowy Ride event would grow to provide such enormous fundraising support for CCIA." "It is only through donations such as this that we are able to pursue our world class research in childhood cancer." Honda Australia Director Robert Toscano said, "Working with the Steven Walter Foundation allows us to directly help kids, but it also allows us to involve our community of motorcycle riders as well as to interact with all the local communities who play host to thousand of riders on their way to Thredbo." "We could be supporting any one of a number of worthy causes; however we have chosen the Steven Walter Foundation because we have witnessed first-hand how effective the monies raised are at helping to combat one of this country's most devastating diseases. Ticket prices includes 3 day entry, VIP seating, lunch, morning & afternoon tea each day, Honda gift and more. Limited tickets are also still available for the "Champions Dinner" on Friday, October 15th. 2 September 2010 - Looking for a great Father's Day present? Limited tickets are still available for Honda Australia's biggest event of the year, Corporate Hospitality at the Phillip Island MotoGP, October 15 -17, 2010. The $785 top notch corporate package includes entry to the circuit, morning tea, lunch and afternoon tea for each day of the event, plus cloak room facilities and grandstand seating. Ticket prices also include live circuit tv screening all the action as it happens, pit passes and a gift of Honda merchandise. Soft drinks are free and bar drinks are also available for purchase. A few seats are also still available for Honda's "Champion's Dinner' to be held on Friday, October 15th at one of the Island's top rated venues, Infused Restaurant. The very popular "Champions Dinner" provides fans an opportunity to get up close and personal with the international star riders. Tickets cost just $155 per head for a three course dinner and MotoGP HRC riders including Repsol Honda's Dani Pedrosa and Andrea Dovizioso, Randy De Puniet, Toni Elias and Alex de Angelis are expected to attend. Master of Ceremonies and special guests for the evening will be Leigh Diffey and Daryl Beattie, both of whom have a history of providing entertaining commentary and rider interviews throughout the event. Bookings are strictly limited for both events so fans are urged to get in quickly. For booking forms for Corporate Tickets as well as the Dinner, please go to: www.hondamotorcycles.com.au and click on "Events". New pricing for SYM Scoota effective the 1st of September 2010. SYM Scoota are getting ready to "Spring" into action. The warmer weather means we are moving closer and closer to the scooter riding season. 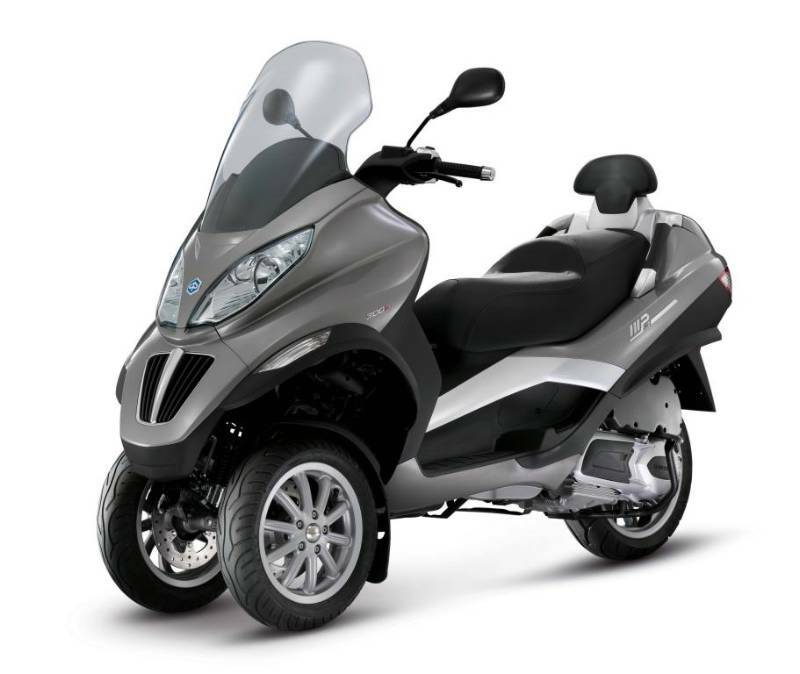 To coincide with the increase in temperature SYM Scoota are rolling back prices, decreasing a number of key models across the range. The Orbit 50 now starting at $1599 + ORC or the all true all-rounder the VS 150 at the new list price of just $2990 + ORC. The new injected HD 200, an amazing value commuter at just $4699 + ORC or the top of the range Firenze 300i for $6290 + ORC. So SYM Scoota claim to have the perfect scoota for everyone, which may just be the case given the value equation from September the 1st, 2010. 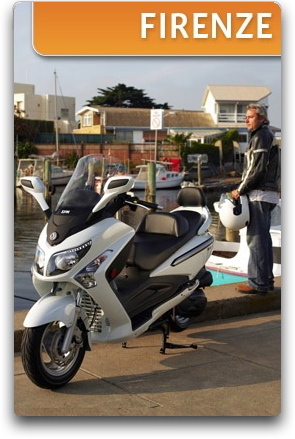 See your nearest SYM Dealer, find out more @ www.scoota.com.au. * The price displayed is the RRP price set by the Australian Distributor and does not contain On Road Costs which differ in each state and or territory. Scootersales.com.au is not the retailer or importer of this product.